There is a high degree of probability that the average man on the street with an American public school education couldn't tell you who or what the Anatolians were; you're likely to get an answer in the form of a question along the lines of, "Weren't they the dudes with the purple shrouds and Nikes waiting for the comet?" or "Wasn't that those guys with the black and white faces on Star Trek?". Anatolia is one of the most influential cultural centers in recorded human history, encompassing most of modern-day Turkey, as well as parts of Georgia, Armenia, Iran, Iraq and Syria and has been home to or occupied by a wide variety of higher civilizations including the Roman Empire, Greece, Persia, Armenia, Assyria and the Ottoman Empire (and no, Man On The Street, the latter is not a furniture chain in North Carolina). 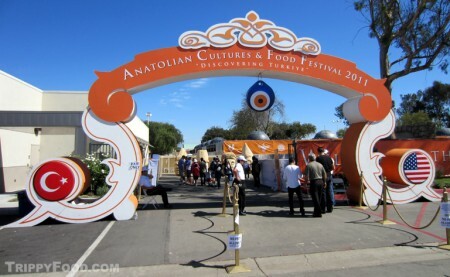 The Anatolian Cultures and Food Festival (the third such event to be held on the sprawling Orange County Fairgrounds) is a celebration of the legacy of each of these groups, including music, food, art, industry and architecture. It was apparent at the entrance that this was would be a culturally enlightening experience after having to walk beneath a giant nazar ("evil eye") dangling from the gateway arch. 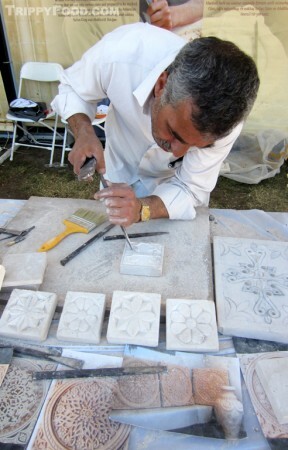 Simply navigating the layout of the festival was itself a history lesson; upon entering, a more than a dozen portals along Civilizations Road led through several thousands of years from the earliest Anatolian cultures to the modern Tűrkiye arch that opens into the fairgrounds. At each Stargate, representatives of each culture greeted fairgoers in typical period clothing, willing to be captured standing next to tourists with their favorite digital soul-stealing devices, and trust me when I say that these may just have been the hardest working staff members at the festival (picture mustering a smile after standing for 8 hours on heated blacktop in leather strap sandals). The central area was populated by umbrella-topped tables and a conveniently located Ottoman Coffeehouse; at the far end, musicians and folk dancers performed on a massive stage during the course of the festival. Cities of antiquity ringed the fairgrounds, cleverly recreated in small scale using a unique process combining photography and carpentry in an effort to realize photo-perfect recreations of historic structures. The concept sounds a little cheesy until you become acclimated to it; metal and wood frames give the structures depth and dimension; actual photographic images are then overlaid on the frames to create three-dimensional photographic renditions of the landmarks. Walking along the grounds past, around and through these structures gave the impression of walking through a photo album; some of them featured educational and historic displays, and booths just inside each city's gates offered textiles, art, and craftworks that the featured city is renowned for. A group of musicians playing traditional Sufi music performed on a small stage set up in the city of Konya and halfway through their "set" brought up a member of the Mevlevi Order of Sufi who demonstrated the practice of "whirling" as part of the formal Sama ceremony. I was considering the whirling dervish a performer but was educated to the fact that his spinning was a religious practice and was asked (along with the rest of the audience) to refrain from applauding. 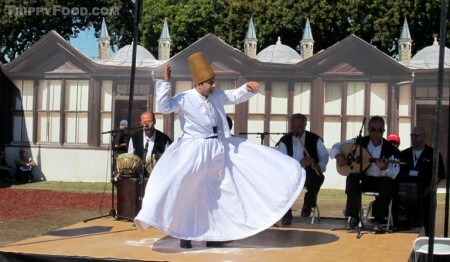 Although the dervish never reached the velocity of Warner Brothers' Tasmanian devil I have to marvel at his ability to rotate constantly without painting the audience with karnıyarık or landing on the small children seated in the front of the crowd. In addition to landmark structures from the cities of Istanbul (featuring the Blue Mosque and Maiden’s Tower); Antalya (with the stone Aspendos amphitheater and Temple of Apollo); Demre; Mardin; Konya (framed by Karatay Gate); and, Van (with models of Hosaf Castle and the oldest surviving Armenian Church of Akhdamar), a scale model of Istanbul's Topkapi Palace was home to the festival's sultan and his court as the actual palace was during the 600-plus years Turkey was ruled by the Ottoman Empire. A 35-member mehter Ottoman Marching Band paraded across the grounds to perform for the sultan in front of the palace and even without amplification they could be heard from anywhere on the grounds, almost drowning out pop singer Ferhat Atli performing on the main stage. The Grand Bazaar was the perfect place not only to pick up Anatolian souvenirs for the kids ("My dad went to the Anatolian Festival and all I got was the evil eye") but also to watch craftsmen selling works created on site. Naturally, travel agencies, airlines and telecommunications companies were also on hand, but I made my way quickly past them to the Anatolian Cuisine Cooking Stage to watch Chef Sureyya Gokeri demonstrate the preparation of Ali Nazik, a dish featuring ground meat with eggplant/yogurt puree. Chef Gokeri earned personal points by turning in a very real and honest performance - it was like watching your mother preparing dinner (if Mom was Turkish). For the most part, she touted using Turkish ingredients, constantly answering her own question to the audience as to why you should by loudly proclaiming, "Because they taste better!" 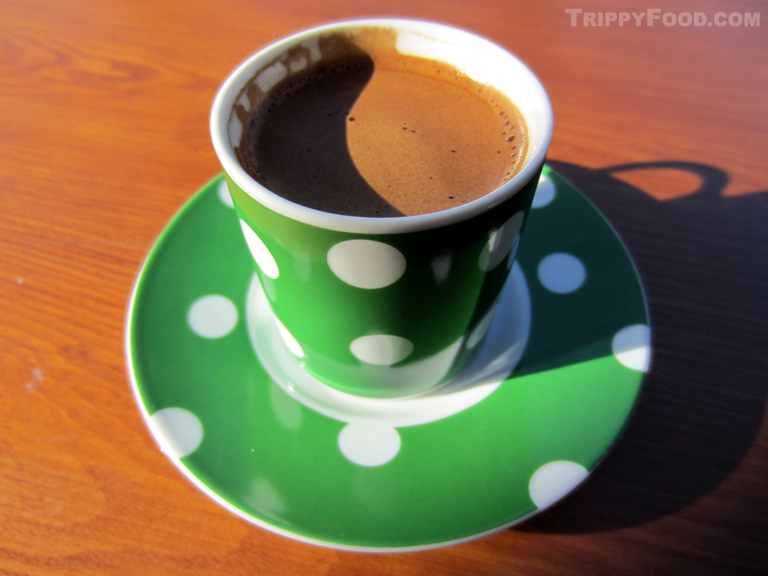 and emphatically stating that the most important ingredient in Turkish cuisine is love. At one point she ladled a generous plastic spoonful of the ground beef into her mouth, shook her head and quietly said, "Nope. It's not hot enough". Foodie snobs would have dropped their serviettes in shock as Gokeri's assistant milled through the audience with a foil tin full of the moist and savory concoction, handing out spoons for all to "dip", but I was in my element and the time I invested in watching the demonstration paid off in spades. A spoonful of sugar may help the medicine go down, but a spoonful of Ali Nazik is hardly enough to satiate an Anatolian hunger, so a stroll to the food court was in order. A replica of the Fountain of Ahmet III stood in the middle of the food court area, where the spigots on the faux-marble walls that have quenched the thirst of weary travelers since 1728 were providing endless streams of dollar lemonade, but I was saving my liquid intake for the Ottoman Coffeehouse after some substantial fare. 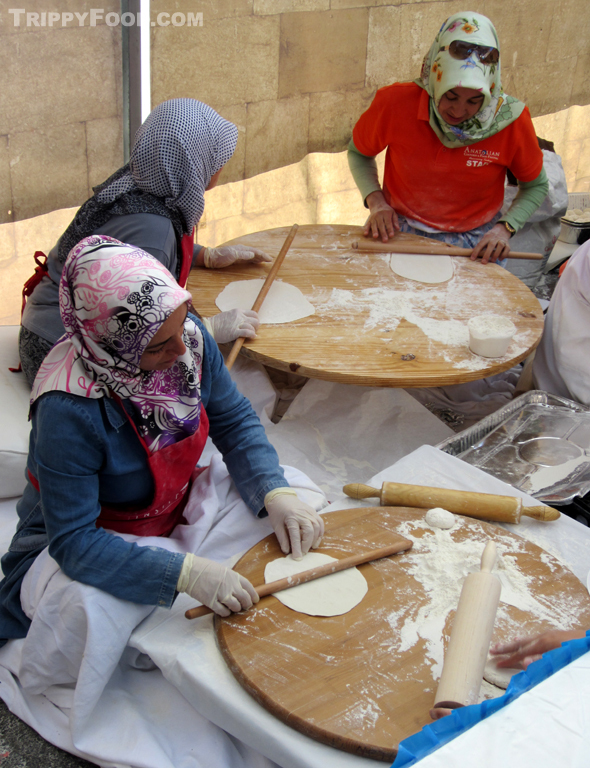 The City of Corum was scooping out massive handfuls of leblebisi, a roasted chickpea snack they're famous for. The copper-clad roaster used to make the leblebisi looked like a high-end cement mixer, but it wasn't churning out product while I stood there. The chickpeas had a smooth, polished, hard shell with a dry and starchy interior. More than a handful of these (tasty as they were) would have driven me to deep-throat one of the lemonade fountain spigots. There were so many amazing dishes I'd never heard of or imagined, making the task of settling on a main course harder than Sophie's choice. I opted to the Anatolian equivalent of a beef burrito - the tantuni. This ideal street food is created by liberally filling a hot lavash (a tortilla-like, flour-based flatbread) with seasoned ground beef, onion, and what I swear to you looked like pico de gallo and then rolling it into a handy, portable bundle wrapped lovingly in a sheet of paper. And the taste... well, was like a ground beef burrito - a delicious, savory ground beef burrito. At a nearby stall I was unable to resist the come-hither of mantı, a diminutive Turkish dumpling that is vended by the cup rather than by the piece. Each Lilliputian, slightly al dente dough packet contained beef and onion and was topped with a ladle of warm yogurt sauce; I sprinkled sumac and dried flakes of mint on top creating a cup of complex flavors and textures that was unlike any other ravioli or dumpling dish I'd ever tried. Several booths were making künefe, a crispy and sweet dessert that resembled a mutant grilled cheese sandwich. 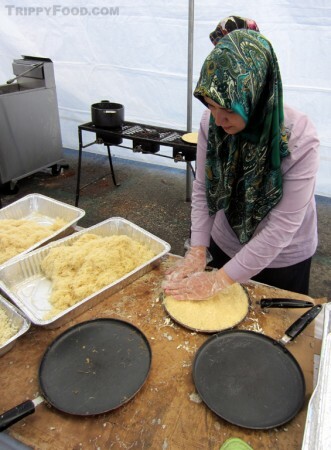 Sweet Nabulsi cheese was sandwiched between layers of threaded phylo dough and then cooked golden brown in a huge flat pan rotated over heat that made it look like a lumberjack-sized pancake. Straight off the stove the cheesy pie was cut into slices and then doused with a ladle of brackish-looking sugar-based syrup. I was expecting a teeth-folding sweetness like its nearby cousin, baklava, but even with the sugar sauce it wasn't overly sweet. A chef from Hatay (the city where the dish originates) also had a tray of pickled black walnuts in syrup, and when I say walnuts I'm not referring to the nutmeat extracted from the hard, woody shell we're familiar with. The nuts are removed from the tree prior to the development of the shell, still encased in the pulpy covering and then brined whole resulting in a remarkably tender fruit that was almost unrecognizable as walnut. Although I'm not much of a dessert person, I was captivated by the güllaç, a wet, white pastry dish. The dough is made from corn starch and wheat flour and layered like lasagna with pistachio and garnished with pomegranate seeds; after its milk bath, the cold dessert tastes like a simplistic cross between rice pudding and noodle kugel. Being that I was stuffed like a karnıyarık, I fought the urge to queue up for dondurma, a sticky ice-cream that is most likely more fun to watch being served than to eat. Erol Kozoglu enjoyed teasing his patrons, holding the confection out (cone attached) with the long metal scoop used to crowbar the ice cream loose and then snatching it back before they could grasp it. The ingredients used to make it result in a chewy ice cream that is probably closer in texture to salt water taffy than a scoop of your favorite Cold Stone flavor. This entry was posted in Middle East, Trippy Happenings (Events) and tagged Abdulhamid Ozcan, açma, Ali Nazik, Anatolia, Anatolian Cultures and Food Festival, Antalya, Armenia, bağlama, bazaar, börek, CA, California, cheese, chef, chickpea, Civilizations Road, Corum, Costa Mesa, Demre, dondurma, eggplant, evil eye, fairgrounds, Ferhat Atli, Fountain of Ahmet, Georgia, gözleme, Greece, güllaç, Hacilar, Hatay, Iran, Iraq, Istanbul, kasarli tavuk köfte, Konya, künefe, leblebisi, lemonade, lokma, mantı, Mardin, mehter, mehterân, Mevlevi Order, Nabulsi, nazar, OC, Orange County, Ottoman Empire, Ottoman Marching Band, Persia, Roman, Sama, Seljuk, sticky ice cream, Sufi, sultan, Sureyya Gokeri, Syria, tantuni, Topkapi Palace, Türk kahvesi, Turkish coffee, Tűrkiye, Van, whirling dervish, yogurt. Bookmark the permalink. 2 Responses to How Bazaar! 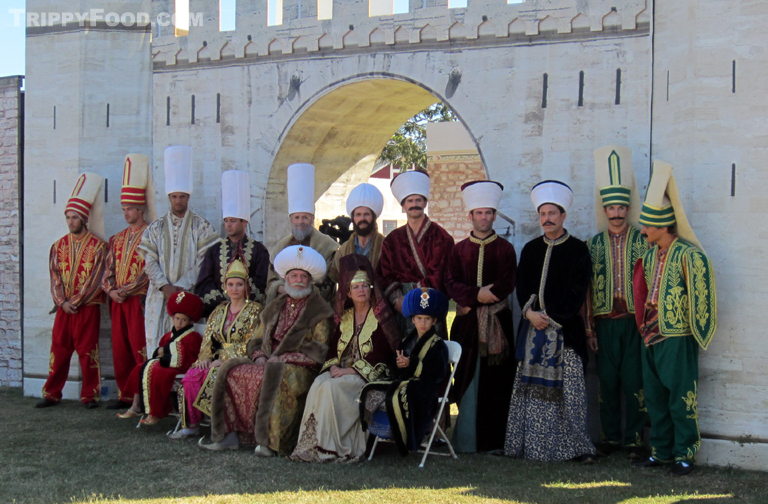 You may be disappointed – the Anatolians won’t be there, but to be fair there were no Klingons at the Anatolian Cultures and Food Festival, either.